A Creamy Day 2 of - "15 days to Thanksgiving"! I am sure you have devoured Potato Gratin a number of times. 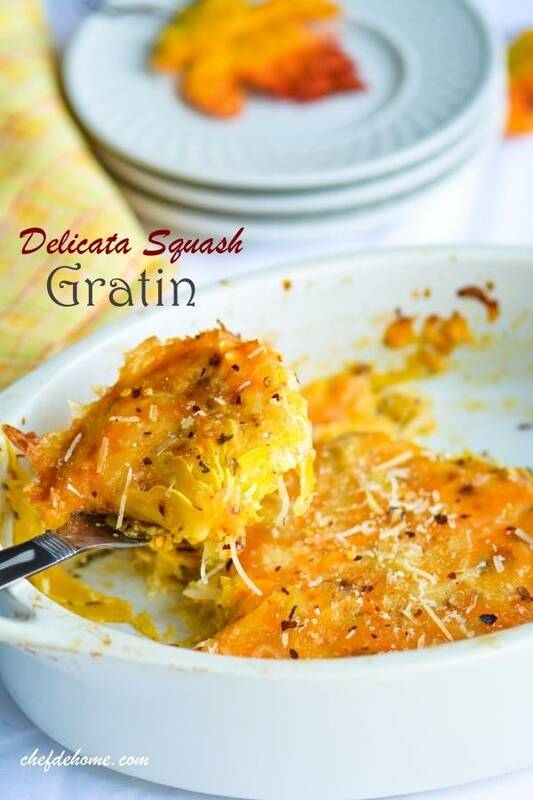 Today, I give you a new way to enjoy creamy and cheese-y gratin with my fall favorite vegetable - Delicata Squash. Delicata squash, as name suggests, is the most delicate squash out of all squash family. Almost has size of 1 and half zucchini, it is soft and less-sweeter than other family-members. Skin of most squash is rich in vitamins and is edible... but is so tough that we mostly discard it. 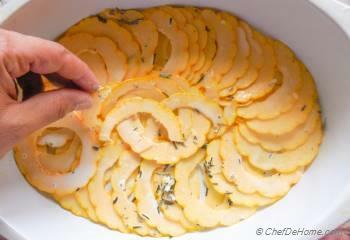 But, delicata squash has beautiful thin skin and it gets very tender on cooking. So, good news!!! 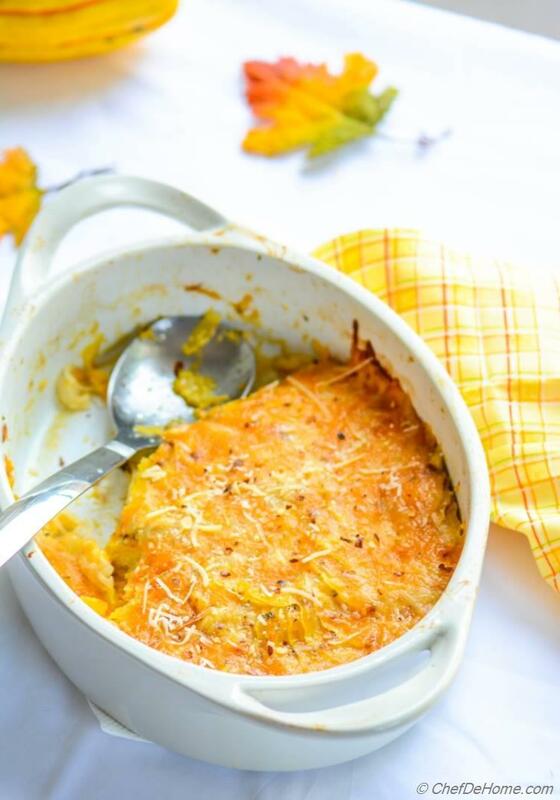 You don't have to do the tedious task of peeling squash before making this gratin. 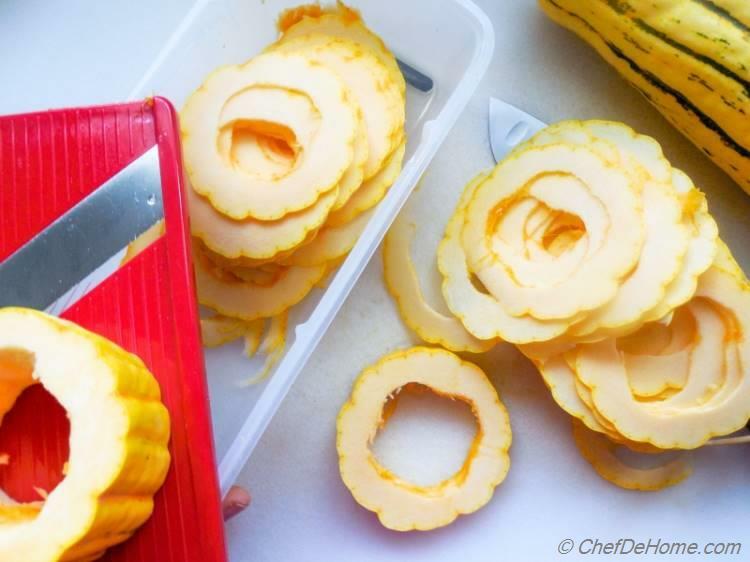 Total prep time for Squash Gratin is less than 15 minutes, provided you have a mandeline to slice squash. I am lucky to buy one recently and enjoying every beautiful slice I carve on that. An awesome tool to own. Trust me!! If you don't have a mandeline, please buy one. 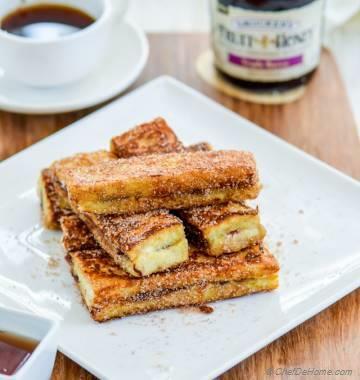 I bought mine from Sur La Table, it comes with 4 attachments and I am loving it! It is worth the prize. Specially for Holiday dinners, a neat presentation counts a million, but you won't have to spend a million on mandeline. even not a penny!! 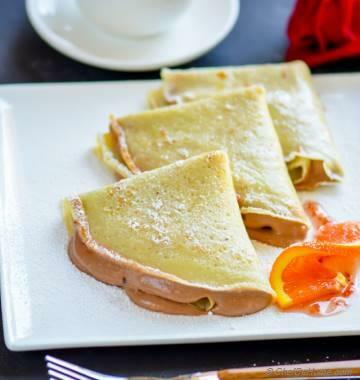 I am running a giveaway for $25 gift card to sur la table. Win the giveaway and go get a mandeline!! Easy?? Isn't it? 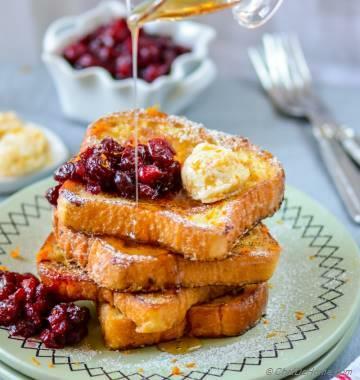 I hope you like the start of recipe and posts countdown for thanksgiving!! So, for second day of thanksgiving dinner countdown, just a quick hi, and hopefully a bit of inspiration to make your holiday meals special. 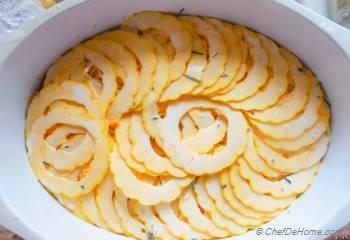 Smart Swap You can also use sweet potato instead of delicata squash. 1. Set oven to preheat at 375 degrees Fahrenheit. 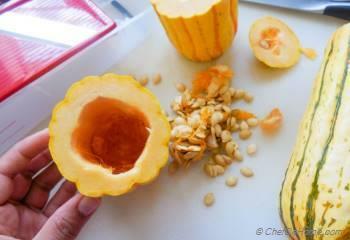 Cut squash in half, remove seeds and fibrous thin layer with small knife. No need to peel-off the skin. 2. In a pan, take cream, milk, all herbs, garlic, and pinch of salt and black pepper. Bring to boil and then remove from heat. Set aside. 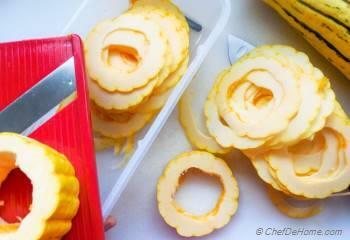 Also, Slice all delicata squash using mandolin into thin slices. 3. 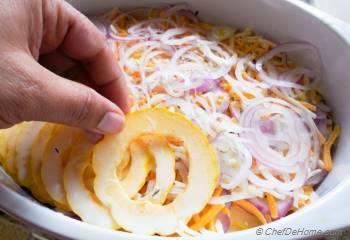 Dip all sliced squash in heavy cream mix. 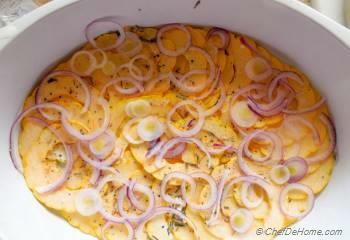 In an oven safe casserole or baking dish (I have used 2-quart), arrange 1/3 of squash slices overlapping each-other in circular fashion. 5. Repeat with another layer of cream-dipped squash overlapping each other there-by covering all of the bottom cheese layer. 6. 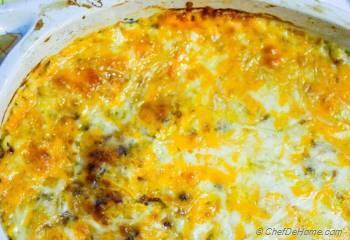 Season again with salt and black pepper, then layer all of the onions and 1/3 cup of the cheddar cheese. Top with last layer of remaining 1/3 of squash slices. 7. Pour the any reaming cream mix on the top. Use of red pepper flakes is optional. But, I love a little touch of heat on this layer. 8. 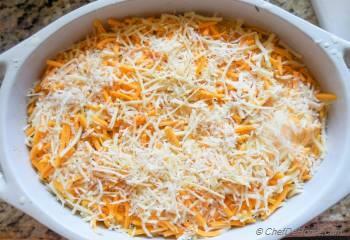 Layer the remaining cheese - all Parmesan and remaining 1/3 cup Cheddar. 9. 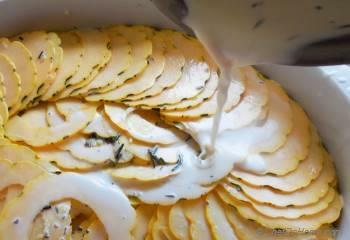 Cover with aluminium foil and bake in pre-heated oven at 375 degrees for 35-45 minutes or until squash is knife tender. After that, uncover and continue baking for 12-15 more minutes until cheese is hot and bubbling. 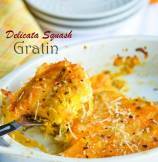 Let the gratin rest for 10-15 minutes before serving, then use a spatula to cut squares and serve immediately. 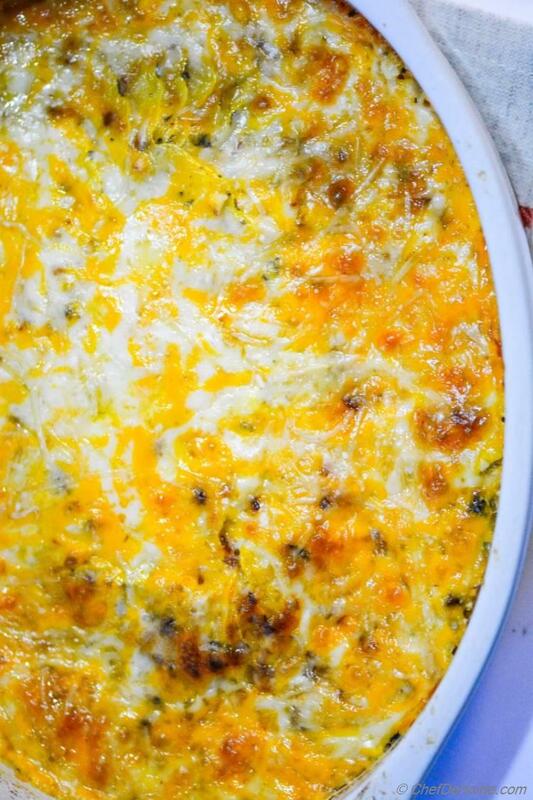 Assemble Ahead: You can assemble Squash Gratin up-to last step, cover with plastic wrap and refrigerate 1 day in advance. Follow the baking instructions above to bake and serve, put in oven about 1 hr before dinner and enjoy!